Conductor Theodoros Kourentzis is best known for his expressive conducting style, commitment to authentic performance, and perfectionism – and now, the only place to see him is the city of Perm in the Urals. Kourentzis, the conductor of the Perm Opera and Ballet Theater, has lived in Russia for the past 17 years, but his conducting career began at the Greek National Conservatoire in his native Athens, where he completed two courses of study: musical theory and string instruments. There, and at the Athens Academy, he also trained as a vocalist, but in the end his exceptional capabilities as a conductor won out. “Everyone thought that I should be a conductor. I started to take lessons – you know, just so I could acquire some extra knowledge and not feel stupid behind the conductor's stand. But even then, my teachers would tell me that this was what I was meant to do, that I should never give up, no matter what,” said Kourentzis. Kourentzis traveled to Russia to study conducting at the prestigious St. Petersburg State Conservatory with Ilya Musin, whose students include Valery Gergiev, Yury Temirkanov, and Vassily Sinaisky. After receiving his degree in conducting in 1999, Kourentzis decided to pursue his career outside the borders of the Russian capitals. “Moscow is in thrall to its own history, its traditions – it's the showcase of Russia. St. Petersburg, on the other hand, is an incredible city, but it’s impossible to shake it up. That’s why everything new and advanced is coming out of the provinces,” Kourentzis said. 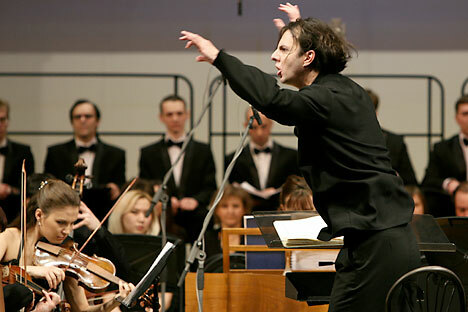 From 2004 to 2010, Kourentzis served as musical director and head conductor for the Novosibirsk Opera and Ballet Theatre, but in January he was appointed creative director of the Perm Opera and Ballet Theatre, where a genuine cultural revolution is brewing at the behest of Oleg Chirkunov, the governor of Perm Territory. Kourentzis did not come to Perm alone; he was accompanied by MusicAeterna, the ensemble specializing in historically informed performances that Kourentzis assembled after receiving the job in Novosibirsk. Originally a chamber ensemble, MusicAeterna is currently expanding, developing a symphonic repertoire and preparing to give concert performances of opera premieres; these have already been planned out several years in advance. Although Kourentzis’s move away from major cities may not be typical for the music world, it’s no surprise for someone who is motivated by making music rather than making money. According to Kourentzis, Europeans go to classical music concerts more out of a sense of tradition than because they are looking for an emotional experience. In Europe, musicians are like office workers, standing up and leaving as soon as their rehearsal is over. In Perm, however, things are different. “I don't even look at the clock. Yesterday we finished a little early; today we finished a little late. There is no 'your life,' 'his life,' or 'my life' here; there is only 'our life.' And once a week, we all get together in the evening to read poetry by candlelight or play music – from medieval to modern. We all love it, even if it means that we go 13 hours a day without putting down our instruments,” Kourentzis said, describing his relationship with his musicians. The performances of MusicAeterna inspired little interest in the Russian public of the 1990's. Their concerts were held in small, half-empty halls, but they were also the ensemble that brought authentic performances back into vogue. Kourentzis has also made significant contributions to other musical genres. Alban Berg's opera Wozzeck, which he presented at the Bolshoi Theatre two years ago with director Dmitry Chenyakov won accolades not just from theatergoers, but also, more unexpectedly, from critics who knew the work well. “It is surprising that the music of Berg, an Expressionist, a member of the Second Viennese School, an adherent to atonality, can sound this undiluted, beautiful, distinct, and pure even with all its chaotic tumult,” wrote a reviewer for the daily “Kommersant” after the premiere. The conductor's other opera productions have included “Aida,” in Novosibirsk, which received the Golden Mask award; “Don Carlos” at the Paris National Opera; and “Macbeth,” first in Novosibirsk, then in Paris. Kourentzis’ first opera premiere in Perm will be Mozart's “Cosi Fan Tutte” in September. “We are going to provide an example of what we in theater call 'purism,’” said Kourentzis, describing what theatergoers could expect. “We will be going against the traditions of contemporary European directors. Because right now, the mainstream looks exactly the same everywhere you go: gigantic screens onstage, action moved to the modern day, the plot changed, and so on. It's like some kind of TV show. Kourentzis takes his new position very seriously. Beginning with the coming season, he will no longer be collaborating with any other Russian orchestras or opera theatres. The only place to hear him will be in Perm. Maybe this will finally lead to the birth of musical tourism in Russia.